Are you new to GLK? Your Pet's Home Away From Home Your pets are part of the family. The Green Level Kennel family understands this, and we promise your dog or cat will be a part of our family while he's here whether it's to spend just a day or a whole vacation with us. 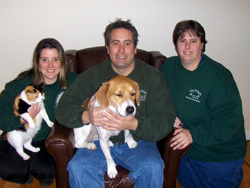 We'd love to have you visit before you decide to leave your dog with us for day care or boarding. You'll find a clean, welcoming environment, friendly staff, and room for your little (or not so little) one to run and play. Green Level Kennel, (919) 362-7877, fax: (919) 362-8483, reservations@greenlevelkennel.com | Base Content Copyright © 2019 Market Hardware, Inc.